“Anyway, ah was trying to say dat every warm-blooded woman me know want children. Yuh don’t want to end up old an’ lonely wid no children.” From Nicole Dennis-Benn’s 2016 novel, Here Comes the Sun. I want to start by letting you know that my husband and I are not parents to any pets. I hope to have a dog one day, perhaps when retired and more available to keep it company, but for now we have no furry or feathered friends dressed in any kind of cutesy clothes. I’m not pet shaming those that do; I’m only clarifying that we do not have pets, despite the fact that we are total animal lovers. We are also not wealthy jetsetters, mingling about and manning our numerous successful businesses while having no time for anything or anyone, but kudos to those that fall under that demographic and find themselves authentically content. My husband and I are simply average folks. Currently in our 50s, we married at 30 and managed to stay together despite having been through, like everyone else, some challenging times and disagreements. But the one thing we agreed upon long ago was our decision not to have a family. I ask my husband often if he regrets that decision, especially now when we find ourselves alone among our solid group of friends – the only couple who have no grown children to speak of, no weddings to plan, no grandchildren to look forward to. 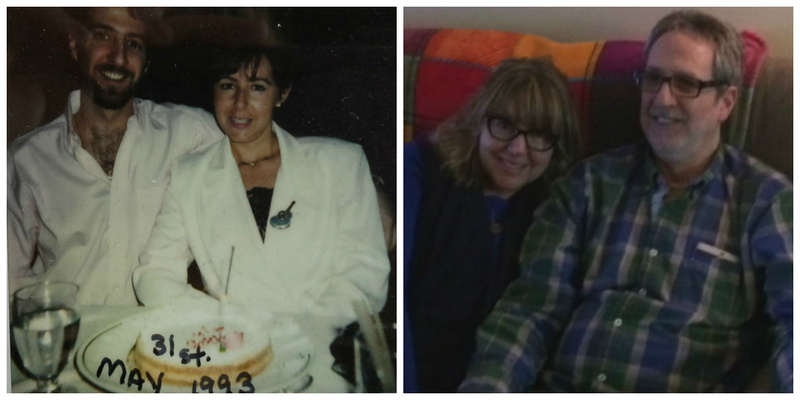 My husband and me – 1993 and today. At a recent charity event we attended, we found ourselves amongst a small group of new and old acquaintances when the discussion veered towards children – whose kids were off to college, and which ones were just finding jobs. The conversation turned downright giddy as each woman gushed over their children’s long list of achievements. One suddenly turned to me and said “And what about you? Are you facing any empty nest syndrome?” At first I felt momentarily insulted that I looked old enough to have kids of college age, and then I felt a tidal wave of inexplicable sadness wash over me. I wanted to retort that I have wonderful nieces and nephews who are very accomplished, but after hearing that I had no children this woman simply abandoned me and my would-be answers, leaving me feeling ironically barren. Despite the enlightened time that we are living in, most women who decide not to have children, are still being labeled as “unfulfilled”. 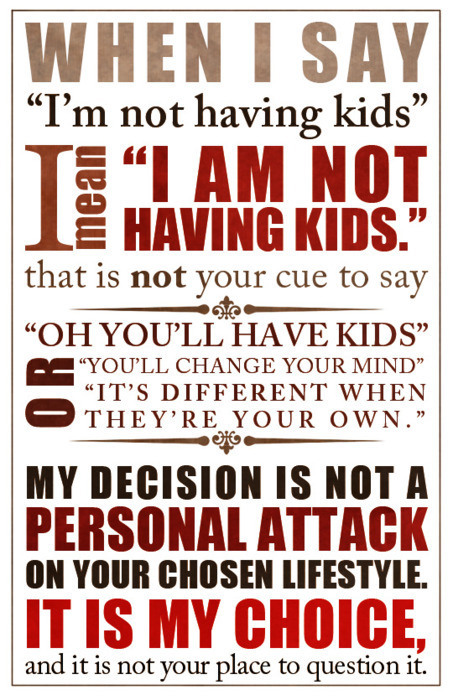 In an article written by Parenthood actress Joy Bryant titled Stop telling me I should have kids!, she in essence writes, “I don’t have the need to breed” and “I don’t need to be a mother in order to be fulfilled in my life.” Somehow, despite the overall acceptance of the new norms that makes up the term “family” in today’s society, when a woman admits to not wanting children a slight slight is still felt. I once had someone ask me why I bothered to get married if I had no intentions of having a family – I did not know they were mutually exclusive. People are not intentionally being rude, but I sense a quiet judgment nonetheless. In the beginning, shortly after my husband and I married, the questions of having a family came up more often, especially since it appeared that all my friends were either getting married or starting a family; it all seemed to fall in line with what naturally occurs and is expected. To my husband and I, we knew going in that having a family was not something we desired. We felt content just the two of us. We were both starting out in our careers, and during the first few years the rhythm of our lives appeared to be work and saving for a home. Then life happened and we matured even faster. Three years into our marriage my mother-in-law got tragically diagnosed with acute leukemia at the age of 56. For 14 months my husband was by her side and the focus was to provide her with physical and mental support. We both developed a different type of rhythm; one that required us to distance ourselves from our friends. Not because we wanted to, but because we were committed to a different cause, and our priorities changed. My mother-in-law sadly lost that valiant battle. At the same time, my concern was growing in regards to my aging parents. My relationship with them was always close, especially with my mom, who not only exceeded in her maternal role but was my most cherished ally. My parents were holocaust survivors and had my sister and me at an older age. I think at times, I parented my parents, I was always very protective over them. The reality of them being almost in their 80s and me only being in my late 30s seemed unbelievable to me. I wanted a kind of reverse “Dorian Gray” situation, whereas I would agree to age but let them stay young and healthy forever! But that was not the case. Just before I turned 40 my dad passed away from complications from by-pass surgery. The years that followed I was fortunate enough to devout my free time with my mom – she spent weeks, weekends and many vacations with us. I was lucky enough to spend this time with her because I did not have other obligations vying for my attention. Would I have been able to do what I could for my mom if I was also nurturing a growing family and balancing work? I’m not certain. I bow down to all those moms who find themselves smacked in the middle of the “sandwich generation,” and juggle all of it and still have the grace and serenity to see the light. I mentioned earlier that I ask my husband of almost 25 years, if he has regrets about not having children. Does he worry about being alone, or who will feed him those beloved yankee beans?. My husband looks at me mocking my sudden serious inquisitiveness by rubbing his non-existent Freud-like beard, and replies first with “where are you going”? He follows that up by saying, less jokingly this time, that he was sure back then and still is now that he did not want the lifetime responsibility that comes with raising a child. He adds that worrying about who will be there for us when we reach our golden years and in need of care is counterproductive, and further still, not a reason to question whether we should have had children. While no doubts or regrets haunt my husband, I in truth do have fleeting moments of what might have been? It’s hard not to, but I think questioning things is what we must always do in life. As women we must always question, discuss and decide truthfully what the right decision for us is, and we must ensure that all women have the wonderful opportunity to choose what they want to do with their body. The important take away is that we always retain that right to choose. We all contribute something valuable to society, whether it’s balancing a family, a job, or simply being generous with our time, spirit and kindness. Sometimes it’s not just about “having it all,” but what you do with what you have that makes you happily “fulfilled”.